Poster for the magician known as Chung Ling Soo, circa 1912. 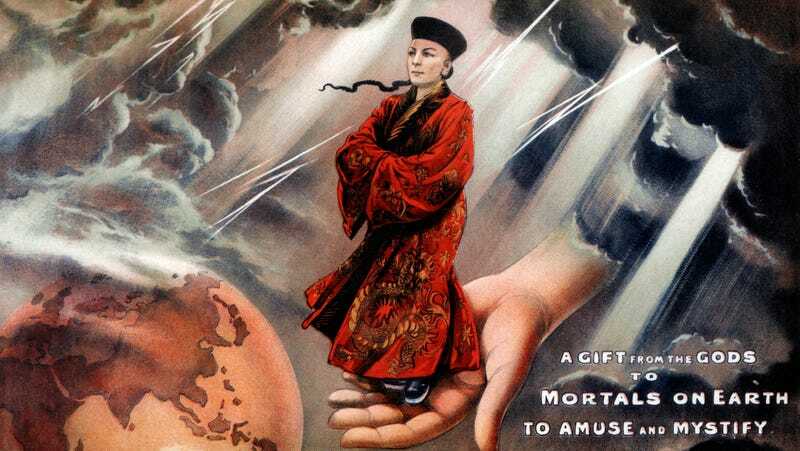 What it’s about: At the beginning of the 20th century, audiences across Europe were wowed by a Chinese magician who drew on ancient Asian mysticism to perform illusions and contact the spirit realm. But he was, in fact, none of these things, as “Chung Ling Soo” was actually William Ellsworth Robinson, an American of Scottish ancestry who built a phony, racist Chinese persona and magic act based directly on that of another magician, Ching Ling Foo (who actually was Chinese). Biggest controversy: Robinson’s yellowface and borderline identity theft were both probably less offensive to audiences in 1900 than what started his rivalry with Foo. Foo (the stage name of Beijing-born Zhu Liankui) was a world-famous magician whose tricks included breathing fire, pulling a 15-foot pole from his mouth, and cutting the head off of a boy, who would then walk off stage, apparently headless. In 1896, Foo issued a challenge offering $1,000 (a princely sum at the time) to anyone who could duplicate his illusions. Robinson, a vaudeville magician who sometimes performed as Achmed Ben Ali, studied Foo’s act when he toured the U.S. and learned his tricks. But Foo refused to meet Robinson on the grounds that he had failed an earlier challenge Foo had laid down. Robinson never forgave the snub. Strangest fact: Even before Robinson stole Foo’s act and mimicked his ethnicity, he broke the magician’s cardinal rule: Never reveal the trick. Two years after Foo’s snub, Robinson published the book Spirit Slate Writing And Kindred Phenomena, which exposed the tricks mediums would use to supposedly contact the dead. It was two years after that that a theater in Paris was looking for a Chinese magician, and Robinson applied for the job. He wore traditional Chinese clothing, put his hair in a queue (shaved in the front, with a braid in the back), darkened his skin with greasepaint, and rarely spoke on stage, using broken English when he did. Unsophisticated audiences of the era believed without question that Robinson was a magician of Chinese descent. Thing we were happiest to learn: Robinson did eventually get his comeuppance, though it took some time. He performed as Soo for five years before Foo called him out for stealing nearly his entire act (and pretending to be Chinese). Foo repeated his earlier challenge, but in reverse—he would perform the impostor’s tricks to show he was the original. Robinson accepted the challenge, but when Foo realized the press didn’t care at all about Soo’s real identity, he backed out again. Robinson continued performing as Soo until 1918, when a trick went horribly wrong. In the “bullet catch” illusion, assistants would fire a gun at Robinson, and he would appear to catch the bullets. In fact, the gun had a secret extra barrel, so the bullet was loaded into one, while the other fired gunpowder with no projectile. However, Robinson got lazy, not unloading the guns properly so he didn’t have to use new powder and bullets. A gunpowder residue built up in the fake barrel, and on one fateful night, ignited, firing the bullet into Robinson’s lung. He died the next morning, and the public was shocked to learn his Chung Ling Soo persona was completely fake. Thing we were unhappiest to learn: Besides all that, Robinson was also quite the womanizer. He leaned into the cliché by marrying his magician’s assistant, Bessie Smith, in 1883. Nine months later, he welcomed a baby girl… only with a woman he had been cheating on Smith with (likely a servant in his parents’ household). His parents raised the child, and he stayed with Smith long enough to have a son with her in 1885. Smith quit as his assistant to stay home with their child, and he took up with a woman who would become his new assistant, Olive “Dot” Path. While Catholic Robinson would not divorce Smith, he simply claimed publicly he and Path were man and wife for the next 20 years. He finally married her in 1906 (though his remarriage was illegal, as he was still married to Smith). But as had become his pattern, he got another woman—Janet Louise Mary “Lou” Blatchford—pregnant shortly after the wedding. Path was furious, but kept up appearances of their not-entirely-legitimate marriage for the sake of the act, while Robinson went on to have two more children with Blatchford. Also noteworthy: Two rival magicians performing at rival theaters until the one with a secret identity is grievously injured doing a bullet trick may seem familiar to fans of Christopher Nolan’s The Prestige. In fact, Chung Ling Soo is a character in the film, though he’s played by Chinese-born actor Chao Li Chi, and is seen pulling objects from a large bowl—a trick made famous by Ching Ling Foo. Did Nolan fall for Soo’s ruse and confuse the two? Or was he merely stoking the real-life rivalry a century later? Best link to elsewhere on Wikipedia: When Soo and Foo were performing similar acts at rival venues, Soo’s home was the London Hippodrome. Constructed in 1900, it opened with a musical review featuring a young Charlie Chaplin, and hosted variety shows and the circus. The interior had a nautical theme and included a 100,000-gallon water tank, “for aquatic spectacles.” In 1909, it was refurbished as a music hall, hosting the U.K. debut of Swan Lake, and the first jazz concert in Britain. Musicals played at the Hippodrome well into the ’50s, when a 12-year-old Julie Andrews made her stage debut. In 1958, it was converted into a nightclub, The Talk Of The Town, hosting a list of popular acts too long to include here. In 1983, it changed its name back to the Hippodrome and became a restaurant, but lost its liquor license in 2005 during a crackdown on drunken violence by the London police. The venue was reinvented again as a casino, which still operates today. Further down the Wormhole: Robinson was part of a long, unfortunate tradition of performers dying in the middle of their acts. We’ll take a look at the rest of that list next week.